Makes 4 small servings. We usually double the recipe. Store leftovers in frig; it's very good the next day. Roughly chop tomatoes, basil, garlic, scallions/onions. 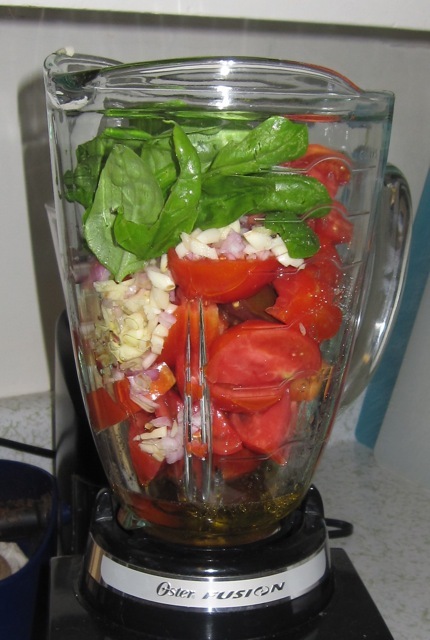 Taste and add more salt, vinegar, cayenne/chile, onion, garlic, basil, oil, yoghurt, tomatoes ... if you like. Store in refrigerator if not serving right away. We use more basil than it calls for. We reduced the amount of garlic. It seems too much garlic can overpower the tomato and basil flavors. We reduced the amount of oil a little. We use regular salt (didn't have any kosher salt) and use MUCH less than what it calls for. Still plenty salty. We reduced amount of yoghurt. Sometimes, if we don't have scallions, we substitute purple or other type onion. We left out the ground black pepper but will try that some time. We skip the fried pecorino Romano. The fried cheese was too salty and to our amazement we didn't like the taste. You can easily leave it out. It's just there for something crunchy on the side and doesn't seem necessary. Might be good served with crunchy bread, however.